“Never judge a book by its cover,” someone once famously said. But the ineffectual grin that Roy Smiles is aiming at his readers is actually a pretty good description of what is between his book’s bindings. The same simple straightforwardness that defines Smiles’s expression is what makes Funny People an amiable but rudimentary read. Subtitled ‘My Journey Through Comedy,’ from the first page, it’s as though we are sitting down with Smiles to watch all his favourite comedy DVDs. Beginning with Bill & Ben, moving through Tony Hancock, Morecambe and Wise, Alan Bennett, Billy Connolly, Bill Hicks and Steve Martin (to name but a few), the great and good are all present and correct. Along the way, we get snippets of Smiles’s life in bite-sized anecdotal chunks. In what is a comprehensive if potted account, there is a lot of recognisable material covered here. But there are also a few hidden gems to be found, such as Bob Newhart and WC Fields and quirky shows like The Flying Nun (“the young Sally Fields [as] a nun whose habit allowed her to fly through the city solving people’s problems.”). This is a man who by his own reckoning has spent a lot of time in front of the telly. As Smiles maps out his comedy history, he uses quotes as markers along the way. Each page is peppered with razor sharp witticisms from artists such as Dean Martin or Richard Pryor. The sheer number of them break any fluidity of narrative but do bring alive his subjects and a lot are laugh out loud brilliant; these comedy heroes of Smiles are included for a reason. Less engaging are the constant sections of his own work. If the intention was to show how indebted he is to these greats, then the comparison is not a flattering one. Smiles’s plays are homages of giants such as Monty Python and The Goons and are probably shown to much better advantage on a stage. He has a natural talent for parody and captures their voices clearly but we want to read the real thing not pages of imitation however well it has been observed. The passages where he has no direct artistic connection are more factual and interesting. A chapter on American comedy is used to give a full sense of individual comedians and also their place within a wider historical context. It’s an engaging read. Though perhaps this is only because I am more interested in comedians such as Lenny Bruce than Ken Dodd. There is nothing in Funny People that you couldn’t find out elsewhere. But whilst it may not hold any major moments of illumination, there is something to please everyone in Smiles’s broad and accessible coverage. Smiles sometimes veers too close to a gushing repetitive fandom (quoting at one point 40 of his favourite Simpsons quotes!) but he is clearly passionate and that buys a lot of goodwill. Endearingly, his final chapter is full of nudges into future research for those readers interested enough to follow them. It is a sweet ending to an otherwise rather frustrating book. Is Funny People an objective history of comedy in the latter part of the 20th century or an autobiographical account of Smiles’ personal taste? It is not far reaching enough to be the former, nor subjective enough to be the latter. Either way, Funny People feels like the work of a genial enthusiast who has perhaps bitten off more than he can chew. The brain child of gutsy hostess Lady Alex The Wam Bam Club is a mixture of vaudeville, burlesque and fine (well adequate) dining, housed in the eternally glamorous Café de Paris. The waiter charmingly asks us for our drinks order and we await our food as the show begins to swirl around us. For the extra £25 you don’t really get much; although the menu looks fantastic, upon the tasting of it, it’s more school dinners than haute cuisine. 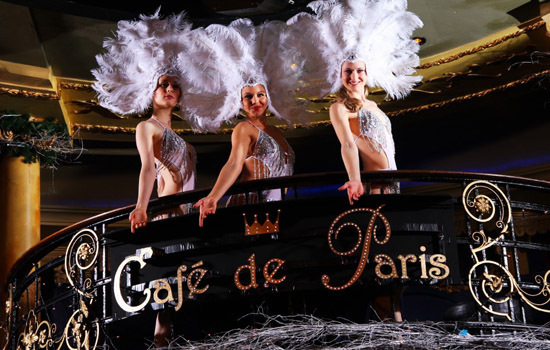 But it is fun to do dinner and a show all at once and soon we are being cheekily teased into the party spirit by the girls of the Cabaret Rouge. Their fruity winks and feathered twirls are impressively performed with full throttled verve and vigour.